Are you a senior executive experiencing frustration or rejection in your attempt to reach the pinnacle of your career? Have you defined your unique career differentiators – your personal brand – and are you seizing every opportunity to promote your brand to hiring influencers and executive recruiters? How many executive career management tools are you using? Do you have a strategic marketing plan supported with a C-Suite portfolio of marketing collateral and executive job search strategies? Do you realize there is a distinct difference between a corporate resume and a board resume? Are you conducting due diligence on a potential employer to uncover their pain points and pitch a business proposal on why they should hire you to solve their pain? It takes a team of people rallying around a leader, or potential leader, to win the popular vote and become the head of a country. Similar to running in a presidential race, every senior business leader needs a campaign manager (executive coach) able to compile a portfolio of marketing documents and strategies to help the executive outshine the other candidates and win a prominent competitive appointment. Martin has helped countless C-Suite leaders execute successful high-level job search campaigns in Canada, the US, UK, and across the world for global brands in every sector. Industry magnets like Amazon, BlackBerry, Ford Motor Company, Sears …and the list goes on. 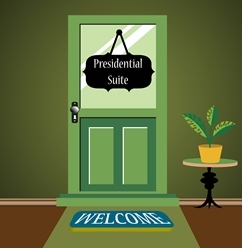 The Presidential Suite of executive career management services has been specifically compiled by Martin Buckland after working with C-Suite executives across the world. This is an exhaustive process of self-discovery and career enlightenment commencing with a client homework assignment and concluding with a portfolio of resume documents and intense multi-faceted coaching to help you win your job search campaign. Each Resume addressed to a very specific audience. A CORPORATE RESUMEmaking you the STAR of your career journey with emphasis on your One Word, Personal Brand and Value Proposition supported by quantifiable accomplishment statements. A BOARD RESUMEis a snapshot of your career appointments focused on leadership attributes to position your viability and value-add for a non-profit or corporate appointment. Coaching specifically addressing the top three coaching needs of every executive. You also have the option of allocating your six hours to meet your individual goals. CAREER COACHING: As a Co-Pilot Executive Coach and Certified Job & Career Transition Coach, Martin will help you identify your career direction, uncover your executive strengths and qualifications, instill the confidence, provide the strategy and support to aggressively pursue your ideal job. PERSONAL BRAND COACHING: Can you define your personal brand in under 21 words? Equally important, can you describe yourself in ONE word? The brand associated with you plays a key role (positive or negative) on your executive career and reputation. As a Certified Personal Branding Strategist, Martin will work with you to understand your strengths, goals, passions, values, and differentiating factors to define and pitch your brand to career influencers. EXECUTIVE COACHING: As a leading Executive Career Management Professional specializing at the senior level, Martin will execute a customized executive coaching strategy. You will explore the core attributes and skill set pertinent to your target job and sector, identify gaps and equip you with an action plan to become an effective senior leader in today’s demanding global economy. Each cover letter written for a specific purpose. While it’s true 50% of hiring influencers don’t read a cover letter, for the other 50% a well written cover letter could make the difference in opening doors and elevating your candidacy. Elite Resumes will provide you with five types of cover letters. Advertisement:The most common cover letter written when applying to an advertised job. Recruiter:Introduce yourself to recruiters and market your differentiators and suitability for client projects. Direct Mail:Open doors at a target company or organization and promote yourself, your expertise and your unique value-add as a highly qualified addition to the executive team. Networking:Referrals are often preferred by a hiring authority. Introduce yourself and gain credibility by sharing a key contact then selling yourself to uncover opportunities or at the very least, land an informational interview. Pain:Not many executives take advantage of, or even know how to write, a pain cover letter. First you will conduct due diligence on a potential employer to uncover their pain points and discuss your research with Martin. After devising the optimal pain strategy, Martin will write a cover letter positioning you as the perfect proactive executive to tackle and resolve their critical business issues, in other words you will alleviate their pain. With the Presidential Suite of executive career management services, you too can REALIZE your greatness, have the COURAGE to pursue your next executive appointment, and REACH the pinnacle of your career. For more information regarding our Presidential Suite Services,Contact Martin Buckland, Co-Pilot Executive Coach, Certified Personal Branding Strategist, Certified Professional Resume Writer, and 7 other career management certifications. Click here to learn more about Martin Buckland.